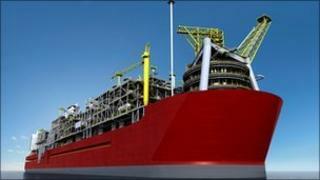 Royal Dutch Shell has taken the investment decision to make the largest floating structure ever built. On 20 May Shell announced in Perth, Australia, the go-ahead for the world's first floating LNG (FLNG) facility. The massive structure weighing around 600,000 tonnes, roughly six times as much as the largest aircraft carrier, will be located over 450 km's north-west of Broome, Western Australia, to process gas from the Prelude field in the Browse Basin. After over 15 years of research, and 1.6 million man hours working on the engineering challenges, Shell will now start the detailed design and construction. The vessel will be built at Samsung's Geoje ship yard in South Korea and is expected to be in service in 2016. The facility has been designed to withstand the severest cyclones and be on site for 25 years. After separating out condensate, LPG and water the gas will be chilled it to minus 162 Celsius to shrink it in volume by 600 times to produce about 3.6 million tonnes per annum of LNG. About 1.3 million tonnes of condensate and 400 million tonnes per annum of LPG will also be produced. The LNG will then be transferred to conventional LNG carriers for delivery to customers across Asia. This will be the first time gas has been liquefied offshore, as until now it has always involved piping gas to a land based plant. The FLNG facility will stay permanently moored at the Prelude gas field and in later development phases should see it processing gas from other fields in the area where Shell has an interest. FLNG will be an industry game-changer. It enables the development of stranded gas reserves and by locating the facilities above the field it reduces cost by removing the need for gas compression stations; long subsea pipelines to shore; a jetty for loading vessels and onshore facilities including roads, storage yards and accommodation facilities. In addition, by building the entire facility in a shipyard it should considerably reduce the cost versus the alternative of building onshore at what are often remote sites far from labour and support facilities. A significant issue for many onshore projects is the time it takes to secure access to land for the liquefaction plants, complete the environmental assessment process, secure all the necessary permits and mobilise the contractors. The project development phase for a traditional onshore LNG project can often take over 10 years, but by going for the offshore FLNG solution project sponsors hope to also substantially reduce the time and cost of the project development phase. Global LNG demand reached 220 million tonnes in 2010. Demand is expected to double this decade and possibly treble between 2010 and 2030. The introduction of floating storage and regasification vessels in 2007 enabled fast cheap entry of new buyers and has seen a surge of activity, as countries such as Argentina, Brazil, Kuwait and Dubai quickly joined the LNG club as importers. Thailand and Singapore will shortly commission their first LNG-receiving terminals, to be followed by Indonesia, Malaysia, Pakistan, Sri Lanka and possibly the Philippines. Within five years nearly all Asian countries could be importing LNG and we are seeing a similar picture in Europe, South America and the Middle East. Global LNG receiving terminal capacity was 350 million tonnes in 2005, 600 million tonnes in 2010 and could reach 950 million tonnes in 2015. Demand, and the capacity to receive LNG, is running ahead of supply as a many of the proposed liquefaction plants were postponed due to the recession and those under construction have been hit by delays and cost overruns. The industry desperately needs a new approach to LNG liquefaction and this should be floating LNG, once Shell and other first movers have proved the cost and time advantages. Shell's decision is a huge vote of confidence in the concept of floating liquefaction. They have the greatest involvement in the LNG industry of any of the oil and gas majors and their decision to go ahead with floating LNG will reassure LNG buyers in the concept and speed up acceptance of other FLNG projects. Shell is already looking at a number of other locations for FLNG, including the Greater Sunrise project in East Timor, and projects in Indonesia, Cyprus, East Africa and South America. Others are close behind them with both Flex LNG and Hoegh LNG hoping to take final investment decisions shortly for two FLNG projects in Papua New Guinea. FLNG is the solution to developing remote offshore stranded gas reserves, but interestingly the next projects could be inshore or even against a berth, as the industry realises the modular approach to building results in a plant that is so much cheaper than the traditional "stick built" onshore facility. Could we be about to see "plug and play" LNG? Tony Regan is a principal consultant for Tri-Zen business consultancy.